China is building high-speed highways | All about CHINA. Chinese Railways is constantly increasing distance of the plots on which trains can reach speeds of over 200 kilometers per hour, while these segments are not numerous, but judging from the assurance from the leadership of the Chinese Railways in the next 2019, the length of high-quality lines will amount to more than 30,000 km In these areas can accelerate trains up to the maximum technically possible speed. Every year, a large section of the road for high-speed communication is leased, in 2018 the country passed a line with a length of 3200 km, and now the total long path for high-speed communication is 30 thousand kilometers. The news is interesting and it is worth believing, as the data published by the managers of the Chinese railway operator China Railway /CR/. Along with the fact that new high-speed highways are being built, outdated lines are also being repaired in the country, the total amount of repair work in 2018 was carried out on a site with a length of 6800 kilometers. This was achieved only because China has enough money and the economy is still on the rise. These are the right investments, these are the investments that should develop the internal infrastructure in the country and thus sponsor the development of business and economic growth in General. Analysts have calculated, and it turned out that China has carried out in recent years the maximum possible reconstruction of all railway lines in the country, the total amount of work from the world indicators amounted to almost 50%. The Chinese economy in this direction was half of the world`s indicators. A lot of work was carried out, the canvas was restored to a qualitatively new level at a total length of 29 thousand kilometers. This data is for the end of 2018. And China is rapidly increasing the flow of passengers who migrate constantly around the country, the total volume of traffic in 2018 amounted to 3.54 billion people and 3.37 billion tons of different goods. 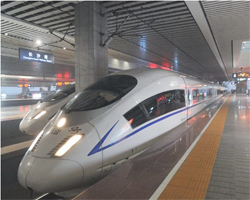 In China, trains run at high speed, at this time on high-speed lines employs 850 high-speed trains, which are known as the "train fusin". This brand of trains will continue to improve, in the future the train will be able to reach speeds of up to 350 kilometers per hour. At this time, the average speed of 200 kilometers per hour. Such an industrial breakthrough was achieved thanks to investments in this industry in the amount of 117 billion us dollars, this is a huge amount. Its development made it possible to launch 4600 kilometers of new Railways at once. Railway transportation in China is profitable, in 2018 the profit growth was 10.9%. With a high degree of probability, the Chinese government will continue to invest a lot of money in rail transport, because the roads are the veins of the economy, there is no civilization without roads.